AOL is looking to turn a profit from its hyperlocal Patch news network this year by possibly shutting down about 300 sites. AOL is mulling shutting down about one-third of its Patch websites, the hyperlocal news sites for communities across the country. About one-third of Patch's 900 sites are underperforming in traffic and revenue, said AOL (AOL) CEO Tim Armstrong on a conference call earlier this week. Armstrong wants to see the Patch network turn a profit by year's end and those 300 or so struggling sites may not make the cut. That could result in hundreds of layoffs for local journalists. Co-founded by Armstrong in 2007, Patch was supposed to replace local newspapers around the country. 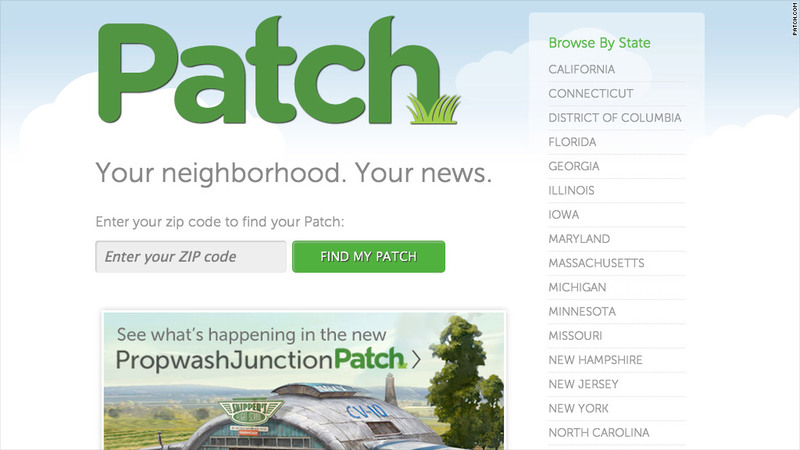 Typically, each Patch website covers one neighborhood and its one or two journalists post stories about local politics, schools, police and community news. The websites also include a schedule of community events and solicits ads from local businesses. AOL acquired Patch for an estimated $7 million when Armstrong became CEO in 2009 and since then has invested millions of dollars into the venture. Are you an Apple Store employee? Share your story! AOL has already reduced Patch related costs by 25% this year, but Armstrong said the cuts would not stop there. Further cost reductions could "negatively impact traffic and revenue, but they will meaningfully improve profitability and AOL's profitability," he said on the call with investors. Some of the struggling Patch websites could possibly merge with others, depending on the structure of the neighborhood. AOL said last year that each Patch site costs the company about $150,000 a year to maintain, but Armstrong said the figure is outdated and the real number is "substantially below that." On the call, the CEO said getting Patch to profitability is a priority for the next two quarters, but plans have not been approved by the board yet. AOL did not immediately respond to a request for comment.